When the very friendly Debrah from Nekojam dropped a message regarding a test-run for The Foobler, I was more than excited to say the least. 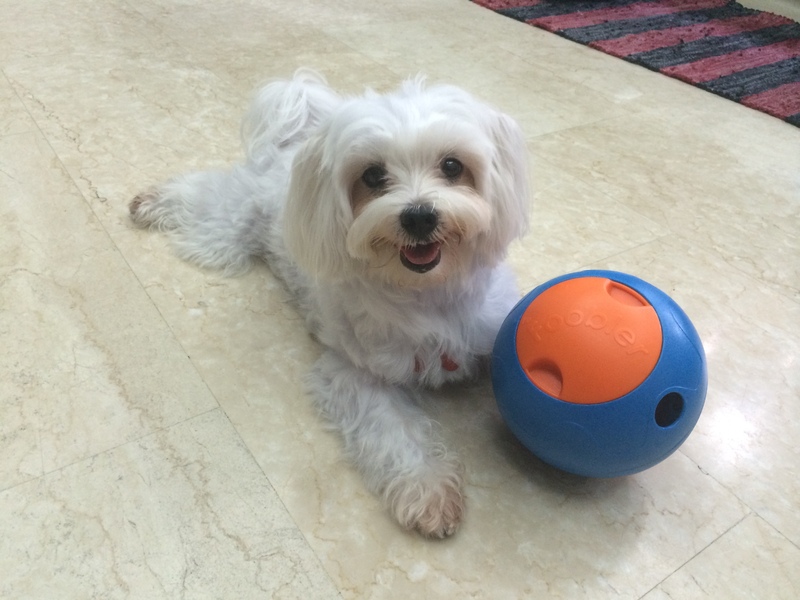 After reviewing 5 of our chosen interactive dog toys and puzzles, the buzz was starting to wear off and a new addition to the proverbial family was neatly well-timed and very welcomed. To preface, The Foobler, from its description, seems to be a godsend for many dog owners out there with busy schedules or dogs with separation anxiety. After all, this new handy dandy gadget promises up to 9 hours of playtime, more than enough to get your pup through the day without you. Its aim is to encourage a dog’s natural instinct to hunt and forage for food. 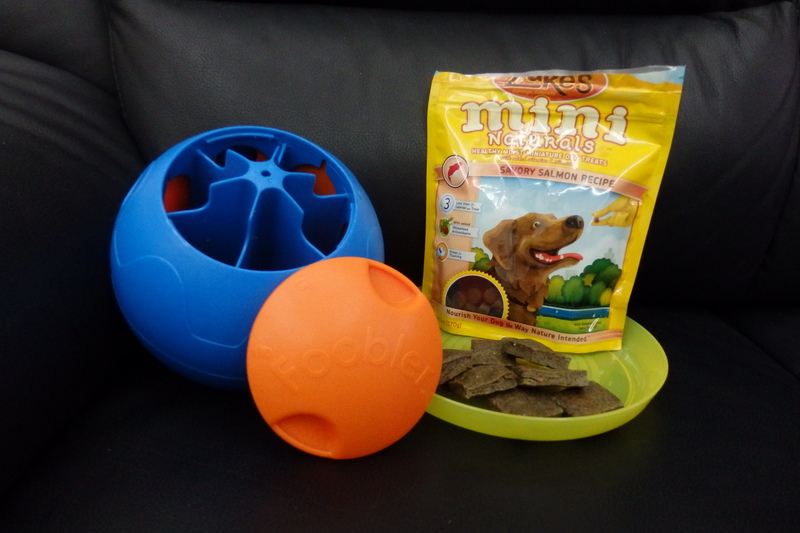 Basically, the Foobler is a timed, self reloading interactive feeder for dogs. Fill its 6 individual pods with kibbles or treats, and it will reload at preset interval (15/30/60/90 minutes), where a metal bell will chime, aimed at creating the Pavlovian (dog) response. 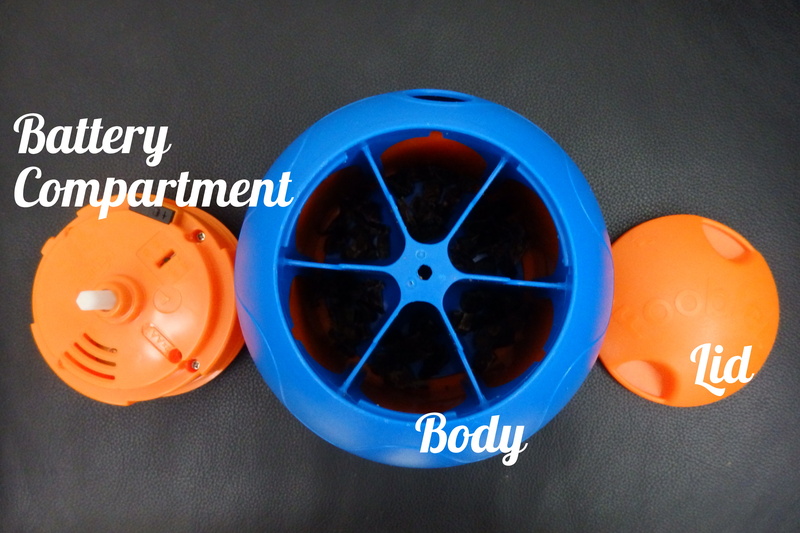 Using my own measuring cup, each pod seems to be able to fill up to 1/3 cup of kibbles, give or take depending on the size of kibble you use! Guys, it’s bigger than my head, HALP! 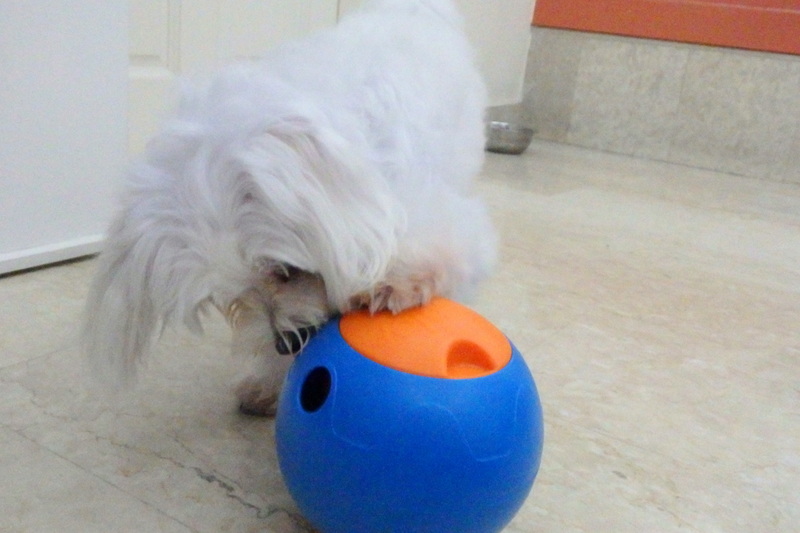 The Foobler comes in only one size (6 inches in diameter) and was much bigger than expected, bigger than Cotton’s head! However, this didn’t pose much of an issue as dogs don’t quite grasp the concept of size! 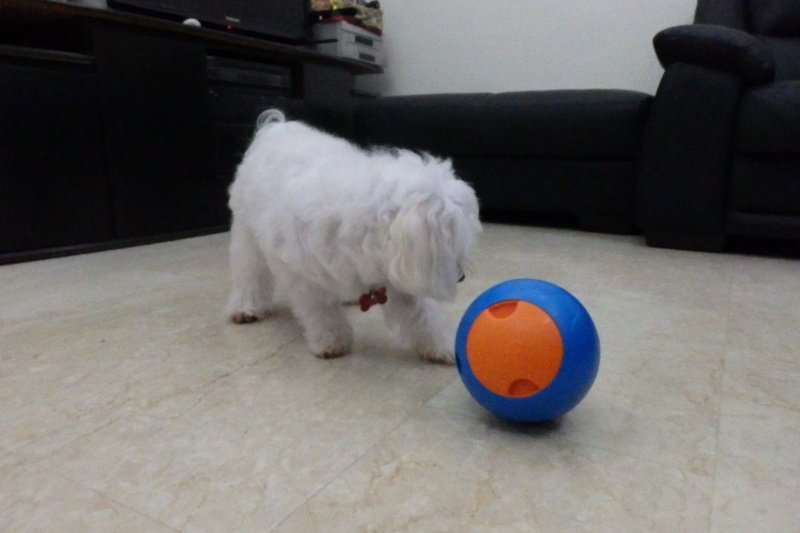 It was conversely a blessing – Its bigger size prevented it from getting into cramped spaces which happened with the much smaller IQ Ball. Digging in (literally), 10 minutes into trying to get to the battery pack, I feared an email titled “I killed the Foobler” was my only choice. Thankfully, further screw driving (myself up the wall) finally revealed the much awaited battery compartment. As I don’t foresee the need to change the batteries that often, this was a minor setback that isn’t a biggie. The metal bell makes a very crisp and clear ringing, but is not ostentatiously shrill, which may benefit dogs that are easily reactive to sudden and/or loud noises. 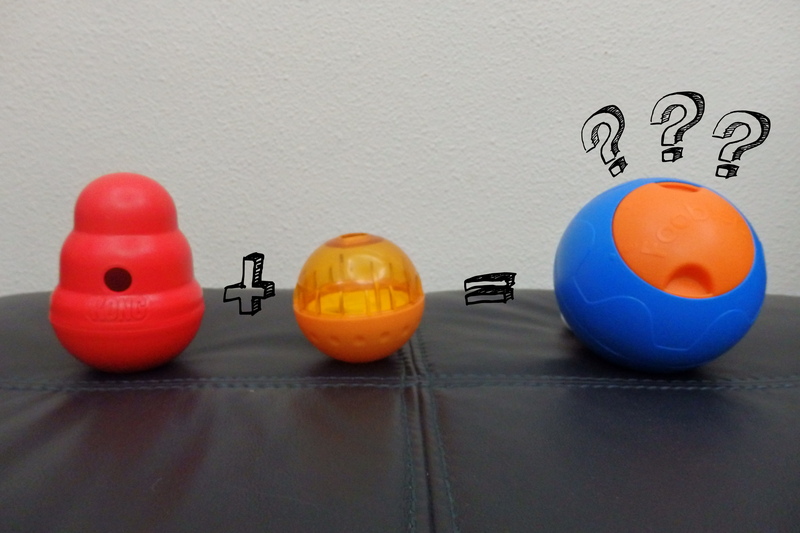 It rolls, yet wobbles, rather like the lovechild of the IQ Ball and the Kong Wobbler, a major plus point for me! 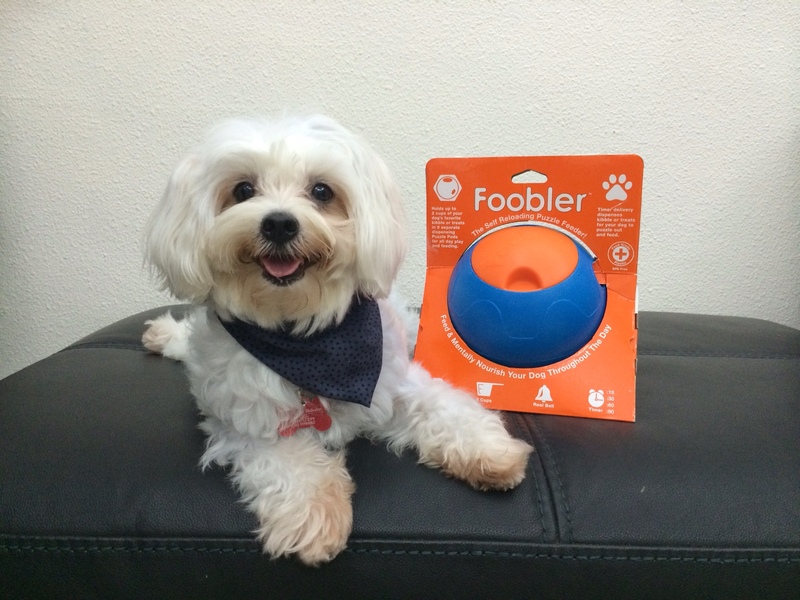 The Foobler is indeed an ingenious creation that will definitely benefit many pups out there. However, there are just some slight areas of the Foobler that could be fixed in the next upgrade. The holes in which the treats/kibbles are dispensed from are rather big; hence Cotton (with her practice with the Kong Wobbler and Bob-A-Lot) managed to get most of the treats out fewer than 5 minutes. This problem will probably be circumvented for doggies on kibble diet, but as Cotton is on home cooked food, we miserly humans could only fill each of the six pods with a maximum of 15 pieces of treats. But, to fix this yourself, it may help if a tiny tape was placed at the kibble exit holes. The Pavlovian Response takes quite a while to be formed, thus far 3 weeks in; Cotton has yet to affiliate the ringing to new treats being dispensed. Overall, the Foobler is an innovative toy that does mostly what it promises. Whether Cotton will eventually associate ringing to new treats being loaded remains to be seen, but regardless, she does interact and enjoy the Foobler very much with or without the affiliation. 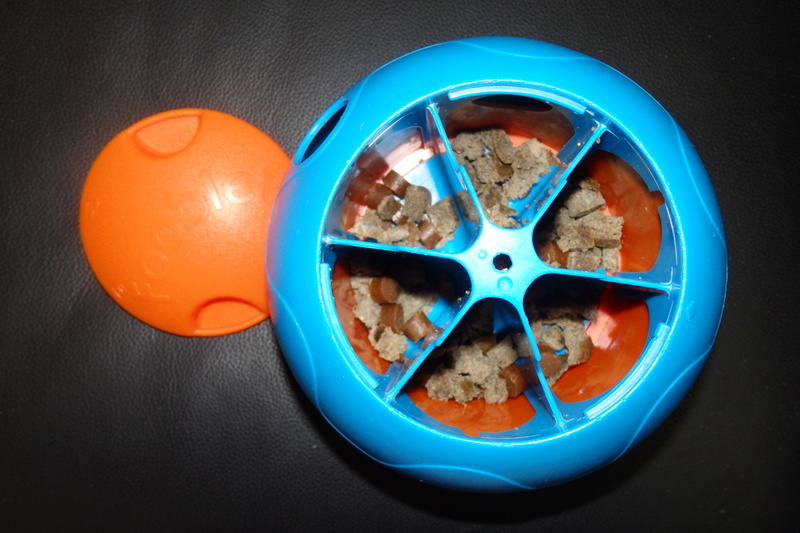 I would sincerely recommend this toy to anyone with a dog that needs to be occupied, it is really a cut above the other one-dimensional interactive feeders! Thank you Nekojam once again for blessing us with this ultra-fantastic toy! Enter “COTTON” at the checkout to get S$5 off The Foobler exclusively sold by Nekojam! Visit our Instagram and Facebook for more updates! Looks like a fun toy. My dogs seem to figure out the puzzle toys quickly so I like that it reloads. We love it! But Donna did get the lid opened, so for bigger dogs it’s not guaranteed. That said, with a reinforced cap, it would be PERFECT! Haha OH! Thanks for telling me, have updated the post 🙂 Has Debrah fixed the problem for you? I love that you post these. What better way to promote a product than to have Cotton try it out. It may be bigger than her head, but she doesn’t seem to let that stop her. She’s so cute! Thank you! 🙂 Haha yes! She’s rather fearless to mostly everything, but she sadly doesn’t know what to do with other dogs!